Backert, S., et al. Expression of Helicobacter pylori Serine Protease HtrA in Campylobacter jejuni Reveals a Crucial Function in Oxygen Stress Resistance, Heat Tolerance and Epithelial Barrier Disruption. (2017) Cell Immunol Serum Biol Sci 3(2): 105- 114. © 2017 Backert, S. This is an Open access article distributed under the terms of Creative Commons Attribution 4.0 International License. Aim: The gastrointestinal pathogens Helicobacter pylori and Campylobacter jejuni secrete serine protease HtrA into the extracellular space, where it cleaves the adherens junction protein E-cadherin. However, while htrA can be mutagenized in C. jejuni, htrA is an essential gene in H. pylori and rapid research progress on HtrA functions is hindered by the nonexistence of ΔhtrA deletion mutants in these bacteria. To bypass this drawback and to study the function of HtrA further, we aimed to clone H. pylori htrA (Hp HtrA) in two C. jejuni strains and study various physiological and virulence properties of the bacteria. Materials and methods: We developed a genetic complementation system to express Hp HtrA in C. jejuni. We have then used numerous approaches to study the growth of the bacteria under various temperature and oxidative stress conditions. We obtained bacteria-free supernatants of cultured bacteria by biochemical fractionation and utilized Western blotting to evaluate the protein content of cellular fractions. Casein zymography was used to determine the proteolytic activity of HtrA. 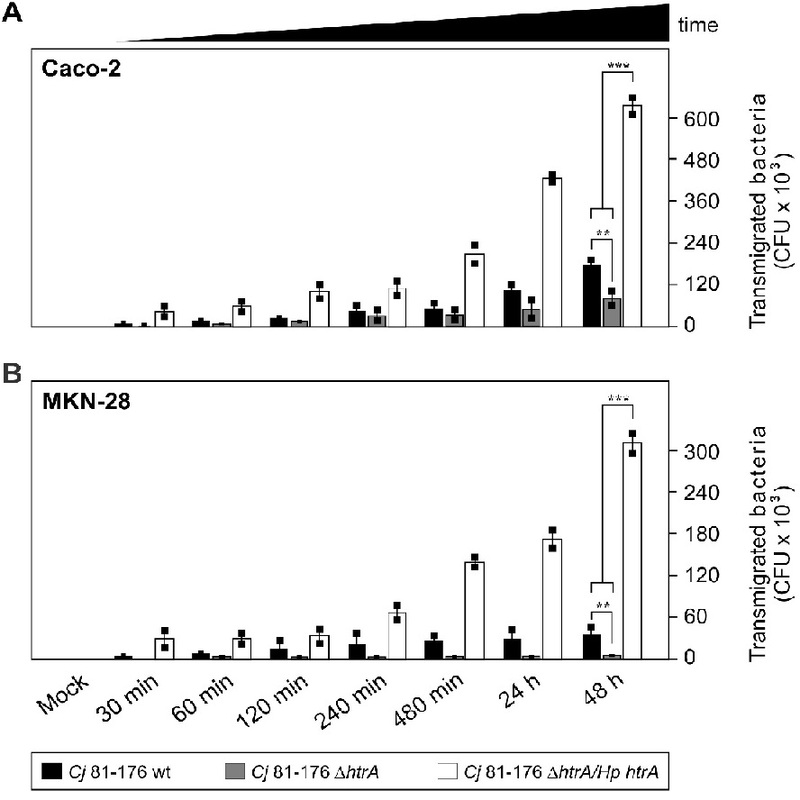 Polarized human Caco-2 and MKN-28 cells grown in a transwell filter system were applied to study the transmigration of C. jejuni. The transepithelial electrical resistance (TER) was measured to characterize the functionality of tight and adherens junctions over time. Immunofluorescence microscopy was employed to visualize the bacteria and E-cadherin during the infection process. Using gentamicin protection assay we quantified the numbers of cell-bound and invasive C. jejuni during infection of INT-407 epithelial cells. Results: HtrA is a central regulator of stress responses and protein quality control in bacteria. Secreted HtrA is implicated in disrupting cell-to-cell junctions, allowing paracellular transmigration of the microbes across polarized epithelial host cell monolayers. Introduction of Hp HtrA in C. jejuni ΔhtrA knockout mutants restored its defects with the following phenotypes: (i) expression of proteolytically active HtrA, (ii) secretion of HtrA into the supernatant, (iii) bacterial growth at high temperature (44°C), (iv) growth at high oxygen stress conditions, (v) bacterial attachment and invasion of host cells, and even substantially enhanced the (vi) disruption of E-cadherin-based cell-to-cell junctions as well as (vii) paracellular transmigration of the bacteria across polarized Caco-2 and MKN-28 epithelial cells. Conclusions: These results establish a genetic complementation system for Hp HtrA in C. jejuni, approve important functional features of the H. pylori protease and allow further detailed examination of htrA functions in vitro and in vivo. Microbial infections of the gastrointestinal tract are responsible for very high rates of morbidity and mortality in humans worldwide. The Gram-negative bacterium Campylobacter jejuni is a typical zoonotic pathogen and the most common cause of bacterial food borne illness. The bacteria colonize the intestinal tract of wild and domestic birds as well as agriculturally important mammals. Thus, C. jejuni exhibits a microaerobic lifestyle with optimal growth temperature between 37°C and 42°C. Transmission to humans commonly occurs via the consumption of contaminated meat and raw milk products, which has been described as the most frequent source of campylobacteriosis. Major virulence properties of C. jejuni are bacterial adhesion to and invasion into intestinal epithelial cells. C. jejuni binding to target cells has been shown to engage a number of outer membrane adhesion factors such as CadF (Campylobacter adhesion to fibronectin), MOMP (Major outer membrane protein) and others. In addition, the chaperone-like properties of serine protease HtrA (high temperature requirement A) appear to assist in bacterial cell binding and invasion, presumably by supporting proper folding of one or more adhesins. Another prototypical gastrointestinal pathogen is Helicobacter pylori, which can persistently colonize the human stomach. About half of the human world population carries these bacteria, and infections are associated with chronic, often asymptomatic gastritis in all infected persons. However, more severe gastric diseases including peptic ulceration and adenocarcinoma can develop in a subset of individuals. The clinical outcome of H. pylori infections is controlled by numerous key parameters such as bacterial genotype, genetic predisposition of the host and environmental factors. Dozens of bacterial factors have been reported to influence the pathogenicity of H. pylori. Two well-characterized virulence factors are the vacuolating cytotoxin (VacA) and a type IV secretion system with the effector protein CagA. Other pathogenicity-linked activities include urease-mediated neutralization of gastric pH, flagella-driven motility, suppression of T cell proliferation, and the action of proteases including HtrA. The HtrA/DegP family members encompass a group of evolutionarily conserved serine proteases and chaperones, which were discovered in most pro- and eukaryotes[8-10]. HtrA proteases commonly contain an N-terminal signal peptide important for Sec-dependent processing and delivery across the bacterial inner membrane into the periplasm, where they assemble proteolytically active oligomers with critical functions in controlling protein quality[8,11]. Whereas all examined HtrAs are capable of forming pyramidal trimers, higher-ordered complexes comprising up to 24 molecules have also been reported. HtrA proteins harbour a trypsin-like serine-protease domain and at least one peptide-binding PDZ domain to ensure efficient removal of misfolded or damaged proteins[9,12,13]. Mutation of the htrA gene is commonly possible in bacteria and leads to abnormal temperature sensitivity of the organisms[8,9]. For example, as compared to wild-type (wt) C. jejuni it was shown that growth of ΔhtrA mutants is significantly diminished at 44°C and tolerance of ΔhtrA mutants against oxygen stress is also severely reduced. Until recently, it was assumed that HtrA proteases are exclusively operating within the bacterial periplasm[8,11]. However, we have hitherto established a novel feature of HtrA from C. jejuni and H. pylori. Both HtrAs are actively transported in the extracellular space, where they can target host cell proteins[14-18]. It appears that HtrA of both pathogens can open the adherens junctions of cultured epithelial cells in vitro by cleaving-off the extracellular NTF (N-terminal fragment) domain of the adhesion protein E-cadherin[14-19]. Mutagenesis of C. jejuni htrA leads to significantly reduced E-cadherin shedding and bacterial transmigration across polarized epithelial monolayers during infection in vitro[16,20] as well as impaired immunopathology and apoptosis in the gut of infected mice in vivo[21,22]. Another model has similarly demonstrated that the outcome of an infection is affected by HtrA, because significant less insect larvae of Galleria mellonella are killed by an htrA mutant as compared to corresponding wt C. jejuni. Remarkably, HtrA is also critical for the virulence of various other pathogens such as Borrelia, Burkholderia, Chlamydia, Klebsiella, Legionella, Listeria, Salmonella, Shigella and Yersinia subspecies[8,9]. In contrast, htrA mutants of H. pylori are not available as knockout mutagenesis in worldwide isolates failed so far, suggesting that htrA is an essential gene in these bacteria[24,25]. To study the role of HtrA further, we aimed to establish a genetic system to express H. pylori htrA (Hp HtrA) in C. jejuni and study the resulting physiological and virulence properties of the bacteria. Our results of the expression of Hp HtrA in C. jejuni ΔhtrA mutants provide for the first time genetic evidence for its crucial function in oxygen stress resistance, heat tolerance and epithelial barrier disruption. The Escherichia coli strain Top10 was purchased from Invitrogen (Darmstadt/Germany) and grown in conventional LB broth medium (10 g/L tryptone, 5 g/L yeast extract, 10 g/L NaCl). The two C. jejuni wt isolates 81-176 and NCTC11168 were used because their genome sequences are available in databases. The corresponding isogenic knockout mutants 11168 ΔhtrA and 81-176ΔhtrA were previously described[4,16]. The C.jejuni strains were commonly cultured at 37°C for 48 hours on Campylobacter blood-free selective agar base containing selective supplement or on Mueller-Hinton (MH) agar plates (Oxoid, Wesel/Germany). In the case of mutant C. jejuni strains, all agar plates were supplemented with 30 μg/mL of kanamycin and/or 20 μg/mL of chloramphenicol, respectively. C. jejuni was grown under microaerobic conditions produced by CampyGen packs in 2.5 liter anaerobic jars from Oxoid. For genetic complementation of the Hp HtrA gene into the C. jejuni chromosome we used plasmid pCam-148 (kindly provided by Dr. Dennis Linton, University Manchester/UK). pCam-148 contains a 2,178-bp fragment of C. jejuni NCTC11168 chromosomal DNA (position 205,297 to 207,475 comprising a pseudogene downstream of Cj0208) cloned into the Smal restriction site of plasmid pUC18. The unique restriction site SpeI in the C. jejuni sequence was utilized to introduce three additional restriction sites (NotI, MluI and NruI) by a primer annealing method. Subsequently, a 1,717-bp fragment of the Hp HtrA gene of H. pylori strain G27 was chemically synthesized (Geneart, Regensburg/Germany). This fragment contained the 200-bp upstream and 75-bp downstream sequences with htrA gene promotor and terminator of the corresponding C. jejuni gene (with flanking NotI and MluI sites), which was ligated into the NotI and MluI sites of pCam-148. A second Hp HtrA gene of strain G27 was chemically synthesized, in which the H. pylori signal peptide (amino acids 1-22) was replaced by the corresponding C. jejuni sequence of NCTC11168. Subsequently, a kanamycin resistance gene cassette (795-bp aph gene with its own promoter from plasmid pRYSK12, kindly provided by Dr. Sabine Kienesberger, University Graz/Austria) was used as a selection marker and ligated into the MluI and NruI site of pCam-148 directly adjacent to the Hp HtrA gene, giving rise to the final complementation constructs. Using an established method these plasmids were then transformed into the C. jejuni 81-176ΔhtrA and NCTC11168ΔhtrA knockout mutants, respectively. Proper integration of Hp HtrA genes in the C. jejuni chromosomes was confirmed by PCR and expression of HtrA proteins by Western blotting. The resulting strains were named 81-176ΔhtrA/Hp HtrA and NCTC11168δhtrA/Hp HtrA, respectively. All bacterial strains (wt C. jejuni, ΔhtrA mutants and corresponding ΔhtrA/Hp HtrA) were grown on MH agar plates at 37°C under microaerobic conditions as described above. The bacteria were suspended in BHI broth. The optical density (OD) was determined by measuring the suspension at λ = 600 nm (OD600) in a UV/Vis spectrometer Lambda 2 (Perkin Elmer, Waltham/USA). The OD600 was adjusted to 0.1 and serial dilutions (10-1 through 10-6) were prepared. Ten μL volumes were spotted onto MH agar plates, followed by incubation under microaerobic conditions at 37°C, 42°C or 44°C, or at 42°C in atmosphere containing ~17 - 18% O2 produced by the candle jar procedure. All experiments were repeated at least three times. Wt C. jejuni and mutant strains were suspended in BHI medium supplemented with 1% β-cyclodextrin. The optical density was determined, adjusted to OD600 = 0.2, and incubated for 12 hours shaking at 150 rpm. The cell pellets and the supernatants were separated by centrifugation at 5,000 rpm. To remove remnant bacterial cells, supernatants were then passed through 0.21 μm sterile filters (Sigma Aldrich, Taufkirchen/Germany). Absence of live bacteria in the supernatant was verified by the absence of colony forming units (CFU) after five days of incubation on MH agar plates. The obtained bacterial cell pellets and supernatants were analysed by casein zymography and Western blotting as outlined below. INT-407 human embryonic intestinal epithelial cells, a typical non-polarized cell line, were obtained from the American Type Culture Collection (ATCC CCL-6). The cells were grown at 37°C in 5% CO2 using 6-well plates with MEM medium containing Earle´s salts and L-glutamine (Gibco, Darmstadt/Germany) and penicillin/streptomycin antibiotics cocktail (Invitrogen). After reaching confluency of ~70%, cells were washed twice with Dulbecco’s Phosphate Buffered Saline (DPBS, Sigma Aldrich), and replaced by fresh antibiotics-free medium 12 hours before infection. For infection, C. jejuni was harvested from Campylobacter blood-free selective agar base containing selective supplement, suspended in BHI medium. The INT-407 cells were infected using a multiplicity of infection (MOI) of 100. After infection of 6 hours, the cells were washed three times with 1 mL of pre-warmed MEM medium per well to remove non-bound C. jejuni. To determine the CFU corresponding to intracellular bacteria, the cells were treated for two hours with 250 μg/mL gentamicin (Sigma Aldrich), washed three times with medium, and then incubated with 1 mL of 0.1% (w/v) saponin (Sigma Aldrich) in DPBS at 37°C for 15 min to lyse the cells. Afterwards, the treated cells were suspended thoroughly, diluted, and plated on MH agar plates. To determine the total CFU of cell-associated bacteria, the infected cell monolayers were incubated with 1 mL of 0.1% (w/v) saponin in DPBS for 15 min at 37°C without prior treatment with gentamicin. The resulting suspensions were diluted and plated on MH agar plates as described above. For each strain, the level of bacterial adhesion and uptake was determined by calculating the number of CFU as described. All experiments were performed in triplicates. Caco-2 cells (ATCC HTB-37) were obtained from a human colon adenocarcinoma. MKN-28 cells (JCRB, #0253) were originally isolated from gastric adenocarcinoma. To study bacterial transmigration, the cells were grown for 14 days in a transwell filter system with pore size of 3.0 μm (Corning B.V. Life science, Schiphol/Netherlands) placed in 12-well plates. As control, the TER (transepithelial electrical resistance) values were measured every two days followed by medium change. Twelve hours before infection, the growth medium was removed, cells were washed with DPBS and fresh medium without antibiotics was added. Infections were carried out with the different C. jejuni strains using a MOI of 50 for the indicated periods of time (30 min to 48 hours). At each given time point, 30 μL aliquots from the basolateral chamber of the transwell were taken and incubated on MH agar plates for three days under microaerobic conditions. The number of transmigrated bacteria was determined by counting the CFU in triplicates. Immunofluorescence staining with different antibodies was performed as described. In brief, cell samples were fixed with methanol at -20°C for 10 min followed by permeabilization with 0.5% Triton-X100 for 1 min and blocking with 1% BSA, 0.1% Tween-20 in PBS for 30 min. Proteins were stained with the α-E-cadherin antibody CD324 (BD Biosciences, San Jose, CA/USA) and α-C.jejuni antibodies (Dako, Glostrup/Denmark). As secondary antibodies, we used TRITC (tetramethylrhodamine isothiocynate) -conjugated goat anti-rabbit and FITC (fluorescein isothiocyanate) -conjugated goat anti-mouse (Thermo Fisher Scientific, Darmstadt/Germany). Samples were analysed using a Leica DMI4000B fluorescence microscope and different lasers (Leica Microsystems, Wetzlar/Germany). Images were obtained via LAS AF computer software (Leica Microsystems) and optimized in brightness and contrast with Image J-win64 (version 2.0). Bacterial cell lysates and culture supernatants were separated under non-reducing conditions in gels containing casein. Subsequently, gels were renatured in 2.5% Triton-X-100 and equilibrated in developing buffer. The caseinolytic activity of the HtrAs was visualized by staining with 0.5% Coomassie Blue R250. Bacterial pellets, cell-free supernatants or infected cells were mixed with equal amounts of 2 x SDS PAGE buffer and boiled for 5 min. Proteins were separated by SDS-PAGE on 8% polyacrylamide gels and blotted onto PVDF membranes (Immobilon-P, Merck Millipore) as described. C. jejuni and H. pylori HtrA proteins were detected by rabbit polyclonal α-HtrA antiserum raised against purified recombinant HtrA[4 and this study]. Rabbit polyclonal α-MOMP antibodies were generated against a conserved peptide of amino acid residues 400-413 (C-NLDQGVNTNESADH). Before addition of the antibodies, membranes were blocked in TBS-T buffer (140 mM NaCl, 25 mM Tris-HCl pH 7.4, 0.1% Tween-20) with 5% skim milk for 2 hours at room temperature. As secondary antibodies, horseradish peroxidase-conjugated α-mouse or α-rabbit polyvalent rabbit and pig immunoglobulin, respectively, were used (Life Technologies, Darmstadt/Germany). Antibody detection was performed with the ECL Plus chemiluminescence Western Blot kit (GE Healthcare Life Sciences, Munich/Germany). All data were evaluated via Student’s t test with Sigma Plot statistical software (version 13.0). Statistical significance was defined by p ≤ 0.01 (*), p ≤ 0.001 (**) and p ≤ 0.0001 (***). Helicobacter pylori htrA (Hp HtrA) is an essential bifunctional gene, which cannot be deleted in these bacteria, having crucial intra- and extracellular activities[24,25]. In order to study the function of Hp HtrA in more detail, we aimed to express the protein by introduction of its gene in the chromosome of C. jejuni. For this purpose, we placed Hp HtrA under the C.jejuni htrA (Cj htrA) gene promotor as described. We also exchanged the signal peptide of Hp HtrA by that of Cj HtrA (amino acids 1-22), because we noted lack of processing when Hp HtrA is expressed with its own signal peptide (data not shown). This construct was ligated to a kanamycin resistance gene, and inserted in the pseudogene downstream of open reading frame Cj0208, a region which is present in the well-known C. jejuni strains 81–176 and NCTC11168. We have previously generated ΔhtrA deletion mutants in both strains[16,31], and correct integration of Hp HtrA in their chromosomes was confirmed by PCR and standard sequencing. The resulting strains were grown on Campylobacter blood-free selective agar plates and tested by Western blotting for the expression of HtrA using specific antibodies raised against Hp HtrA and Cj HtrA, respectively (Figure 1A/C). The blots indicate that both wt C. jejuni and Hp HtrA complemented strains show similarly strong HtrA signals, while their ΔhtrA deletion mutants did not as expected. The α-MOMP blots served as loading control and confirmed that equal amounts of protein were present in the samples. These data confirm that our Hp HtrA expression system works well in two C. jejuni strains and is very useful for further studies. Figure 1: Western blotting confirms genetic complementation and expression of the H. pylori htrA gene in two C. jejuni ΔhtrA deletion mutants. The H. pylori wild-type (wt) htrA gene with the Cj promoter was introduced in two C. jejuni strains. Wild-type (wt), isogenic ΔhtrA deletion mutants and complemented ΔhtrA/Hp HtrA strains of C. jejuni 81-176 (A) and NCTC11168 (C) were grown on Campylobacter blood free selective agar base containing selective supplement. 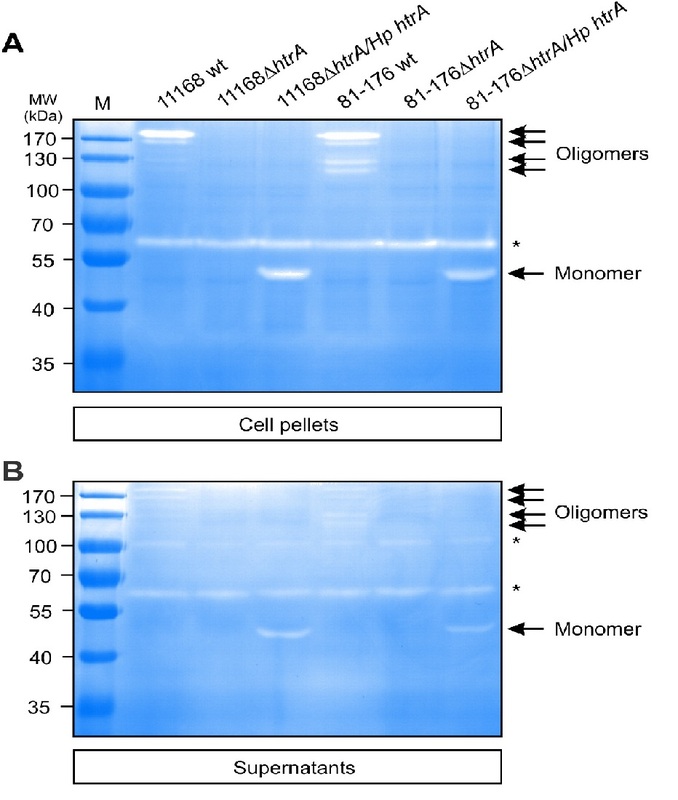 Western blotting of proteins in the cell pellets using specific α-HtrA antibodies revealed the absence or presence of HtrA protein expression, respectively. As loading control, the α-MOMP blots confirmed that equal amounts of protein were present in each sample. To test if Hp HtrA can be secreted into the extracellular space by the complemented C. jejuni strains, the bacteria were grown for 12 hours in BHI broth medium containing 1% β-cyclodextrin and cell-free supernatants were prepared and subjected to Western blotting analyses (corresponding panels B and D). The α-HtrA blots confirm the presence of HtrA proteins. Absence of bacterial lysis and cell debris in the supernatants were verified by probing with the α-MOMP antibody. To test if Hp HtrA can be secreted into the extracellular space by the complemented C. jejuni strains, the bacteria were grown for 12 hours in brain heart infusion (BHI) liquid broth medium containing 1% β-cyclodextrin. The supernatants of all above grown strains were prepared and investigated by immunoblotting using the two α-HtrA antibodies. The results show that wt C. jejuni and htrA complemented strains exhibit similarly strong Cj HtrA and Hp HtrA signals in the supernatant fraction, respectively (Figure 1B/D). As control, the supernatants were incubated on agar plates for at least five days in anaerobic jars to exclude bacterial growth. In addition, we probed the supernatant fractions with α-MOMP antibodies. The resulting α-MOMP blots demonstrate that the supernatants are devoid of MOMP, indicating absence of lysed bacteria or cell debris. We then analysed if secreted Hp HtrA is proteolytically active and subjected the above fractionated samples to casein zymography. Bacterial pellets and culture supernatants were loaded onto 0.1% casein containing gels and separated as described. The results showed that Hp HtrA from both C. jejuni strains gave rise to active protease bands (Figure 2). Interestingly, while we have seen Cj HtrA oligomers with a molecular weight ranging from ~120 kDa up to about 200 kDa in the bacterial pellet (Figure 2A, arrows) and supernatant (Figure 2B, arrows), Hp HtrA was predominantly visible as active monomer. As control, corresponding signals for proteolytically active HtrA were lacking in both ΔhtrA deletion mutants as expected (Figure 2A/B). Taken together, these experiments denote that the complemented C. jejuni strains are capable of expressing and exporting proteolytically active Hp HtrA in a similar manner as their aboriginal Cj HtrA into the extracellular environment. 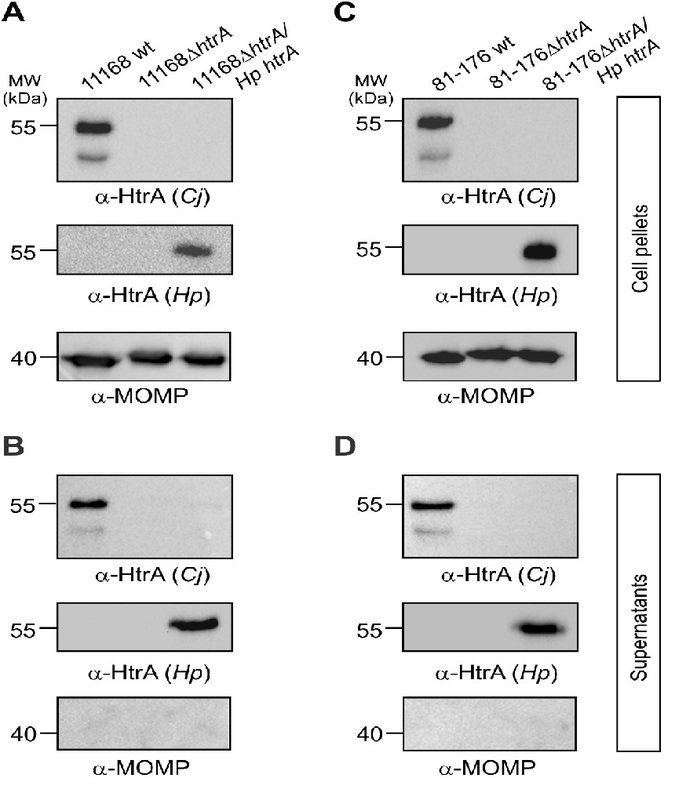 Figure 2: Casein zymography of cell-associated and secreted proteins from complemented C. jejuni strains reveals the production of proteolytically active Hp HtrA. Wild-type (wt), isogenic ΔhtrA deletion mutants and complemented ΔhtrA/Hp htrA strains of C. jejuni 81-176 and NCTC11168 were grown in BHI broth medium containing 1% β-cyclodextrin for 12 hours at 37°C. Bacterial cell pellets (A) and cell-free supernatants (B) were prepared and subjected to investigation of protease activity by casein zymography. The position of proteolytically active monomeric and oligomeric HtrA proteins is denoted with arrows. Asterisks indicate the presence of HtrA-independent proteins with proteolytic activity at about 65 and 100 kDa, respectively. M, protein size marker. As next we aimed to investigate the growth of complemented C. jejuni strains on MH agar plates at 37°C, 42°C and 44°C under microaerobic conditions (~ 5% O2) or at 42°C in the presence of ~18% O2 (Figure 3). Using a series of sequential dilutions, we could show that all strains were growing equally well under microaerobic conditions at 37°C and 42°C, but growth of the NCTC11168ΔhtrA mutant was severely reduced at 44°C and tolerance of the mutant to an atmosphere containing 18% O2 was strongly diminished as compared to the isogenic wt isolate (Figure 3A-D). Genetic complementation of Hp htrA in the ΔhtrA mutant strain restored C. jejuni NCTC11168 growth in the presence of 5% O2 at 44°C (Figure 3C) and growth in the presence of 18% O2 at 42°C (Figure 3D). The same experiments were performed with wt, °htrA mutant and complemented Hp htrA in strain 81–176 with similar results compared to the NCTC11168 strain (data not shown). Taken together, these experiments demonstrate that Hp HtrA plays a crucial role in heat tolerance and oxygen stress resistance of these bacteria. Figure 3: Genetic complementation confirms the importance of Hp HtrA in heat tolerance and resistance to oxygen stress by C. jejuni. C. jejuni NCTC11168 wild-type (wt), 11168ΔhtrA and complemented 11168ΔhtrA/Hp htrA were spotted in serial dilutions onto MH agar plates as indicated. The bacteria were grown for three days in jars under microaerobic conditions at 37°C (A), 42°C (B) and 44°C (C) or at 42°C in the presence of 17 - 18% O2 (D). Representative sections of the agar plates are shown from three independent experiments. The results indicate that introduction of the Hp htrA gene in the C. jejuni ΔhtrA mutant restored bacterial growth under the indicated stress conditions. Previous work has indicated that the chaperone activity of Cj HtrA contributes to binding and invasion of INT-407 intestinal epithelial cells by NCTC11168 C. jejuni. Consequently, we aimed to investigate if our Hp htrA complemented strains can restore this phenotype in the ΔhtrA deletion mutants. To this end, non-polarized INT-407 cells were infected for 6 hours with the above strains, followed by gentamicin protection assays and counting of the CFU. The resulting data demonstrate that both C. jejuni wt and Hp htrA complemented strains can substantially adhere to INT-407 cells at similar level, while both ΔhtrA deletion mutants revealed a strong decrease in the number of cell-associated bacteria (Figure 4 and data not shown). In addition, we confirmed in control experiments that 250 μg/mL gentamicin killed all extracellular bacteria. In agreement with the cell binding properties of described strains, we found that both wt C. jejuni and Hp htrA complemented strains were able to invade INT-407 cells, albeit the complemented strain at reduced level, while the two ΔhtrA deletion mutants exhibited significantly lower rates of invasion as expected (Figure 4). These outcomes further highlight the concept that HtrA is playing an important role in bacterial binding to and entry of intestinal epithelial cells. In the next set of experiments, we aimed to analyse if the complemented C. jejuni strains can restore the transmigration defect of ΔhtrA knockout mutants across polarized epithelial cells as reported previously[16,31]. To test this proposed function of Hp HtrA, polarized intestinal Caco-2 cells and gastric MKN-28 cells were differentiated over 14 days in a transwell filter system. The TER was determined and reached values between 400 - 450 Ω/cm² in the confluent Caco-2 cells and 140 - 160 Ω/cm² in the confluent MKN-28 monolayer, similar to previously reported data. The cells were then infected with the above C. jejuni strains, followed by quantifying the CFU from the bottom chamber during a time course of 0.5 up to 48 hours. The results demonstrate that C. jejuni 81-176 wt and the Hp htrA complemented strains transmigrated quickly during the first 30 min and, in case of Hp htrA, even increased dramatically up to ~630,000 CFU over time (vs. ~180,000 for wt C. jejuni) in infected Caco-2 cells (Figure 5A) and up to ~330,000 CFU (vs. ~40,000 for wt C. jejuni) in infected MKN-28 cells (Figure 5B), while the isogenic ΔhtrA deletion mutant exhibited a significant transmigration defect. Similar observations with regard to transmigration rates were obtained when we compared the various strains of NCTC11168 in parallel experiments. As control, non-pathogenic Escherichia coli did not transmigrate under the same conditions as expected (data not shown). These observations further support the idea that Hp HtrA plays an important role during transmigration of these bacteria across polarized epithelial cells. Figure 5: Transmigration of C. jejuni across polarized epithelial cells is enhanced by genetic complementation of Hp htrA. Differentiated Caco-2 (A) or MKN-28 (B) epithelial cells were grown in a transwell filter system for 14 days to establish confluent monolayers. The cells were infected in the apical chamber using an MOI of 50. A time course of infection with wild-type (wt), isogenic ΔhtrA deletion mutants and complemented ΔhtrA/Hp htrA strains of C.jejuni 81-176 is shown. Transmigrated bacteria were harvested from the bottom chambers, grown on MH agar plates, and the numbers of CFU were determined in triplicates. Finally, confluent polarized epithelial cells were infected with the various wt and mutant C. jejuni strains for 24 hours and subsequently subjected to immunofluorescence microscopy staining against the adherens junction protein E-cadherin and C.jejuni. The results validate that the signals of C. jejuni wt or mutant bacteria (red) attached to the apical surface of host cells are similarly high between the samples. However, while the mock control cells (Figure 6A) and ΔhtrA deletion mutant (Figure 6C) infected cells revealed typical E-cadherin signals between all neighbouring cells, infection with C. jejuni wt or Hp HtrA expressing bacteria disrupted the E-cadherin staining significantly (Figure 6B/D). Individual cells showing downregulated or dislocated E-cadherin signals are marked with blue and yellow arrowheads, respectively. The number of cells with changed E-cadherin patterns was also pronounced during infection with Hp htrA (Figure 6D). These data further support the view that Hp HtrA is playing an important role in bacterial disruption of host cell-to-cell junctions, allowing subsequent travel of the bacteria across polarized epithelial cell monolayers. Figure 6: Disruption of E-cadherin-based cell-to-cell junctions by C. jejuni expressing Hp htrA. Polarized Caco-2 cell monolayers were left untreated (mock) (A) or infected for 24 hours with C. jejuni 81-176 wild-type (wt) (B), 81-176ΔhtrA (C) and complemented 81-176ΔhtrA/Hp htrA (D). The cells were prepared for immunofluorescence using α-E-cadherin (green) and α-C. jejuni (red) antibodies. Arrowheads highlight the position of significantly downregulated (blue) or disrupted (yellow) E-cadherin signals. Scale bars, 10 μm. During evolution bacterial pathogens of humans have developed sophisticated strategies in order to survive and colonize under extreme conditions or to dampen the host defense machinery. Serine proteases of the HtrA/DegP family are key players in protein quality control and stress responses through degrading or refolding of misfolded and mislocalized proteins in the bacterial periplasm[8,9]. In Escherichia coli, DegP was described as an ATP-independent heat shock protease that maintains protein homeostasis in the periplasm by combining both protease and chaperone activities. In addition, in many pathogenic bacteria HtrA promotes virulence as mirrored by the observation that ΔhtrA knockout mutants show an either non pathogenic phenotype or significantly diminished virulence properties[8,9]. A widespread explanation for the HtrA-dependent pathogenesis arose from the observation that HtrA increases bacterial survival under stress conditions during infection. In addition, it was proposed that HtrA may be involved in the processing of outer membrane proteins, which mediate host cell contact. Our previous reports suggested that HtrA of C. jejuni and H. pylori can be secreted into the cell culture supernatant, where HtrA plays a major role in paracellular migration of the bacteria across polarized epithelial cell monolayers in vitro[14-16]. In Chlamydia trachomatis, HtrA functions as an active chaperone and serine protease, which is secreted from chlamydial inclusion bodies into the host cytoplasm, where it exhibits a critical role for the replicative phase of the chlamydial developmental cycle. These data highlight the fundamental importance of HtrA in bacterial pathogenesis. However, the detailed molecular mechanisms are still widely unclear. In addition, research progress on H. pylori HtrA is mainly hampered by the lack of ΔhtrA knockout mutants. Consequently, alternative genetic manipulation strategies are necessary to study HtrA during bacterial infection. Here we developed a genetic approach to express Hp HtrA in two C. jejuni isolates, and studied important physiological and virulence properties of the pathogen. Using this strategy we could establish its important role in heat tolerance, oxygen stress resistance, epithelial cell adhesion, invasion and epithelial transmigration of the bacteria. Besides the successful expression of Hp HtrA in C. jejuni as confirmed by Western blotting, we tested if the strains can generate proteolytically active HtrA oligomers (Figures 1 and 2). Using casein zymography, we could demonstrate that wt C. jejuni, but not Hp HtrA complemented C. jejuni, formed caseinolytic active oligomers with expected sizes of trimers and higher. Instead, we found the Hp HtrA monomer as predominantly active form in C. jejuni. The latter observations are in disagreement with reports on HtrA in H. pylori and other bacteria such as E. coli, where the HtrA oligomers are highly proteolytic active rather than the monomer[12,25]. The reason for this discrepancy is not yet clear. The HtrAs of C. jejuni and H. pylori share only 49 % identity at the amino acid level, thus they are substantially diverse and can exhibit similar but also different functions. It might be that proteolytic processing or other posttranslational modification(s) of HtrA in C. jejuni are required for oligomer formation and due to the sequence variance of Hp HtrA, such modification(s) might not occur compared to endogenous Cj HtrA. This phenomenon should be investigated in more detail in future. However, another important feature of HtrA in C. jejuni and H. pylori is its capability to be effectively secreted into the extracellular environment of the bacteria[14-16]. Interestingly, the level of HtrA secretion into the supernatant of cultured C. jejuni was similarly high and independent of the expressed HtrA type. This means that the protein secretion machinery is not affected in the complemented C. jejuni strains and Hp HtrA is recognized as proper cargo for delivery into the extracellular environment. The HtrA secretion mechanism itself, however, is still not known as discussed previously[20,31]. Forthcoming experiments should study in detail how HtrA is secreted by C. jejuni. During transmission from one host to another, C. jejuni requires substantial fitness to adapt to and survive in a changing natural environment. In the present study, we have first investigated the importance of Hp HtrA expression in stress tolerance by C. jejuni. We could show that complemented Hp HtrA is required both for oxygen and heat tolerance (Figure 3), which may be essential for survival of the bacteria during the contamination cycle or when the host increases its body temperature during fever. In agreement with previous reports, we could demonstrate here that Hp HtrA is required for C. jejuni growth at high temperatures up to 42°C. Brøndsted and colleagues hypothesized that C. jejuni HtrA is a functional orthologue of HtrA from E coli, which is involved in the degradation of non-native proteins in the periplasm. Thus, the temperature sensitivity of the C.jejuni ΔhtrA mutants could be a result of the accumulation of misfolded proteins in this subcellular compartment, similar to observations made in E. coli[11,12]. This idea is further supported by genetic complementation of the temperature-sensitive phenotype of an E. coli htrA mutant with C. jejuni wt htrA. 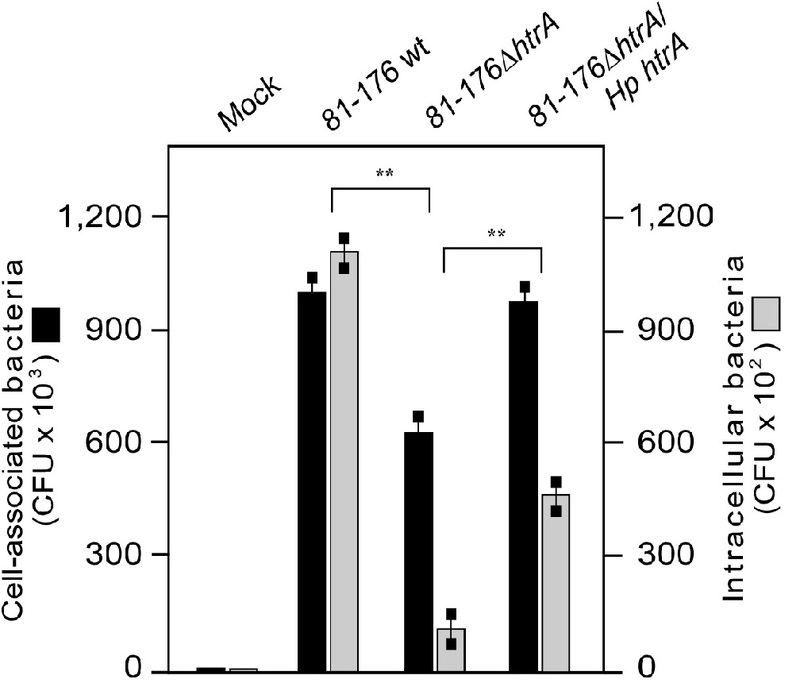 In contrast to many but not all ΔhtrA mutants of other pathogenic Gram-negative bacteria, the C. jejuni ΔhtrA mutants showed reduced oxygen tolerance. Even though C. jejuni and H. pylori are microaerophilic pathogens, they are able to perform aerobic respiration, and an increase in oxygen tension could result in the accumulation of oxidatively damaged proteins in the periplasm that require removal by HtrA. Our experiments confirmed these earlier observations and showed that this phenotype in the C. jejuni ΔhtrA mutant can be restored by Hp HtrA complementation. Previous studies have shown that binding of C. jejuni to epithelial host cells is highly dependent on HtrA expression. In addition, an ΔhtrA mutant was detected in a C. jejuni transposon library screened for reduced invasion capability. Both studies concluded that particularly the chaperone activity of HtrA may have a significant impact on the interaction of C. jejuni with host cells. We can show here that the lack of C. jejuni ΔhtrA in host cell binding and invasion can be restored (at least in part) by the expression of Hp HtrA (Figure 4). Previous studies have shown that inactivation of HtrA reduced bacterial binding to epithelial cells about 5 - 10 times more, as compared to any other known C. jejuni adhesin, suggesting a pleiotropic effect. Impaired adherence and invasion of the ΔhtrA mutant cannot be explained by reduced C. jejuni motility, since the ΔhtrA mutation does not affect these parameters. Instead, Brøndsted and co-workers suggested that the reduced adherence of the ΔhtrA mutants to epithelial cells can be caused by misfolding or improper localization of one or more adhesion factors. One such option is the CadF adhesin for the basolateral receptor fibronectin, which could explain why apical colonization is similarly high between ΔhtrA mutants and wt C. jejuni in the mouse gut in vivo[21,22]. Alternatively, HtrA may influence other processes in the periplasm such as N-linked glycosylation of C. jejuni surface proteins like PEB3 and thereby could impact bacterial adherence to epithelial cells. These various options should be investigated in future studies. Finally, deletion of the htrA gene in two strains resulted in strong deficiency of C. jejuni to travel across polarized MKN-28 epithelial cells cultivated in a transwell chamber[15,16]. We demonstrated here that genetic complementation of Hp htrA can not only restore the deficiency of ΔhtrA mutants to transmigrate across polarized MKN-28 and Caco-2 epithelial cells, but even enhanced this function about 3.5-fold to 8-fold compared to Cj htrA (Figure 5). We propose that this difference could be due to pronounced E-cadherin cleavage of Hp HtrA compared to Cj HtrA as also seen by immunofluorescence microcopy (Figure 6). Altogether, HtrA appears to be a pivotal factor which may allow C. jejuni to cross the intestinal barrier in order to access deeper tissues. In fact, live C. jejuni were recovered from other organs in infected animals such as the spleen, mesenteric lymph nodes, blood and liver. This suggests that C. jejuni exhibits the capacity not only to adhere to and enter into enterocytes, but can also travel within the host, pass the intestinal epithelial barrier, enter the lamina propria and even access other organs of various infected hosts. Thus, the contribution of HtrA in these processes should be studied in more detail. Taken together, our results demonstrate that various described phenotypic defects of C. jejuni ΔhtrA mutants can be restored by genetic complementation of the wt Hp htrA gene. This suggests that we have established a reliable genetic system serving as an important new tool for further mutagenesis of Hp htrA across the entire gene and more in-depth functional studies of this important new virulence factor. This work was supported by grants of the German Science Foundation to M.B. (project BO4724/1-1), N.T. (project TE776/3-1) and S.B. (project A04 in CRC-1181). The funders had no role in study design, data collection and analysis, decision to publish, or preparation of the manuscript. We thank Drs. Dennis Linton (University Manchester, UK) for providing the plasmid pCam-148, Sabine Kienesberger (University Graz/Austria) for plasmid pRYSK12 and Lone Brøndsted (University of Copenhagen, Denmark) for the α-Cj HtrA antibody. We also thank Wilhelm Brill for excellent technical assistance. This work was supported by the German Science Foundation to MB (project BO4724/1-1), NT (project TE776/3-1) and SB (project B10 in CRC-796 and A04 in CRC-1181). 1. Young, K.T., Davis, L.M., Di Rita, V.J. Campylobacter jejuni: molecular biology and pathogenesis. (2007) Nat Rev Microbiol 5(9): 665-679. 2. Poly, F., Guerry, P. Pathogenesis of Campylobacter. (2008) Curr Opin Gastroenterol 24(1): 27-31. 3. Cróinín, T.Ó., Backert, S. Host epithelial cell invasion by Campylobacter jejuni: trigger or zippermechanism? (2012) Front Cell Infect Microbiol 5(2): 25. 4. Brøndsted, L., Andersen, M.T., Parker, M., et al. The HtrA protease of Campylobacter jejuni is required for heat and oxygen tolerance and for optimal interaction with human epithelial cells. (2005) Appl Environ Microbiol 71(6): 3205-3212. 5. Robinson, K., Letley, D.P., Kaneko, K. The Human Stomach in Health and Disease: Infection Strategies by Helicobacter pylori. (2017) Curr Top Microbiol Immunol 400: 1-26. 6. Backert, S., Tegtmeyer, N., Fischer, W. Composition, structure and function of the Helicobacter pylori cag pathogenicity island encoded type IV secretion system. (2015) Future Microbiol 10(6): 955-965. 7. Mejías-Luque, R., Gerhard, M. Immune Evasion Strategies and Persistence of Helicobacter pylori. (2017) Curr Top Microbiol Immunol 400: 53-71. 8. Frees, D., Brøndsted, L., Ingmer, H. Bacterial proteases and virulence. (2013) Subcell Biochem 66:161-192. 9. Skórko-Glonek, J., Figaj, D., Zarzecka, U., et al. The extracellular bacterial HtrA proteins aspotential therapeutic targets and vaccine candidates. (2016) Curr Med Chem. 10. Wessler, S., Schneider, G., Backert, S. Bacterial serine protease HtrA as a promising new target for antimicrobial therapy? (2017) Cell Commun Signal 15(1): 4. 11. Hansen, G., Hilgenfeld, R. Architecture and regulation of HtrA-family proteins involved in protein quality control and stress response. (2013) Cell Mol Life Sci 70(5): 761-775. 12. Clausen, T., Kaiser, M., Huber, R., et al. HTRA proteases: regulated proteolysis in protein quality control. (2011) Nat Rev Mol Cell Biol 12(3): 152-162. 13. Backert, S., Boehm, 1 M., Wessler, S., et al. 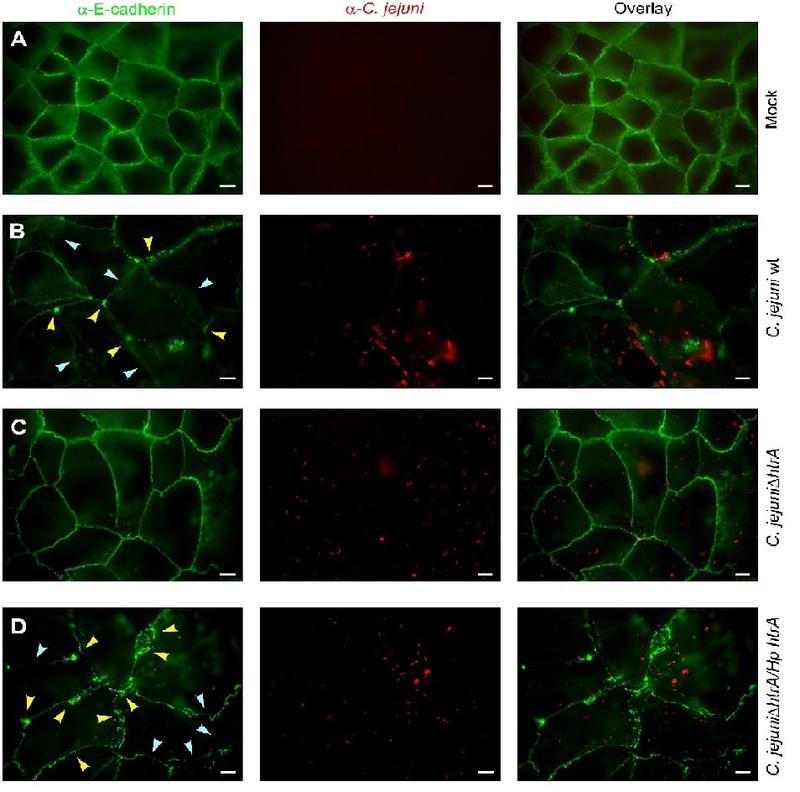 Transmigration route of Campylobacter jejuni across polarized intestinal epithelial cells: paracellular, transcellular or both? (2013) Cell Commun Signal 11: 72. 14. Hoy, B., Löwer, M., Weydig, C., et al. Helicobacter pylori HtrA is a new secreted virulence factor that cleaves E-cadherin to disrupt intercellular adhesion. (2010) EMBO Rep 11(10): 798-804. 15. Hoy, B., Geppert, T., Boehm, M., et al., Distinct roles of secreted HtrA proteases from gram-negative pathogens in cleaving the junctional protein and tumor suppressor E-cadherin. (2012) J Biol Chem8 23(13): 10115-10120.